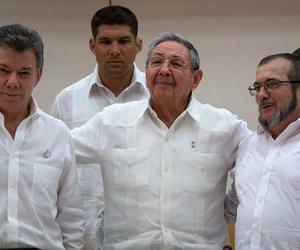 The delegations of the Colombian government and the FARC-EP announced through a joint communiqué that they will sign this Thursday in Havana a bilateral and final ceasefire accord. They informed the text will include disarmament and establish safety guarantees and the fight against criminal organizations that are responsible of genocide or attack the defenders of human rights, and members of social and political movements. The signing will take place at the El Laguito hall, with the participation of Colombian President Juan Manuel Santos, FARC Commander Timolon Jimenez and the guarantor countries: representing Cuba, President Raul Castro, and Norway, Foreign Minister Borge Brende. A host of world leaders have confirmed their presence at the historical event: Presidents Michelle Bachellet, from Chile, Nicolas Maduro from Venezuela, Danilo Medina from the Dominican Republic, and Salvador Sanchez from El Salvador. United Nations Secretary General Ban Ki Moon along other high officials of that organization will be in Havana as well as envoys from the United States and the European Union.